Holidays are something that I am kind of discovery as I go along. Some days just feel suspended, and different than others. Sometimes I can tell why, but sometimes I cannot. If I feel pulled towards a certain date for some reason, I tend to do whatever feels right for me to do to acknowledge that day. Some holidays are less single days, and more festival-like. So the list below is not complete, but just a sampling of the holidays I observe. I do not always observe full moons, but they are particularly sacred times for me. They are the days Z is tied to during the lunar cycle, and a handful of our major dates such as our anniversary (see below) were marked by the full moon. I tend to feel more open on these days, and hold on less tightly to everything, so it is a good time for intuition for me. This is a newer one on my radar. It is a period of time that feels like death and rebirth, and some sort of new year for me. Which makes sense, because that is about what it meant to the ancient Minoans (and other ancient cultures). You may be able to stick Lammas in here somehow; I was just made aware of that holiday recently and have not looked into it too much yet. I figure details about this will eventually work themselves out. This one’s personal relevance also has not settled yet. The past two years, intuition has kicked in. The main thrust of it for me seems to be cooking a meal as an offering to Zagreus. It was around this time I discovered the relevance of certain foods like figs, and raspberries. I think I currently tend to view it as a kind of thanksgiving, where it feels important to make an offering to my god and have it accepted. I love Halloween a lot, but the spiritual significance is also still settling in (see a pattern here? In my defense, I have been at this pagan “holiday” thing for only two years). We tend to celebrate with a party, and I feel the veil thinning, so to speak. This is more the day I celebrate regarding the dead. I grew up in the heart of Texas, so was heavily exposed to the Day of the Dead celebrations. I bake loaves of pan de muertos (a type of bread only made for this holiday, with orange, and sugar, and anise), and we spruce up ancestor altars and make offerings. It tends to be quiet and thoughtful, for me. I was born, raised, and live in the USA, so this is a holiday I grew up with. We make a lot of food and share a meal with family and friends, enjoy each other’s company, and generally feel grateful for our blessings. Late November, early December. For those just tuning in, my partner, Z, found me in very bad shape in the Elsewhere. He saved me, and tended to me, helping me start to heal. It was not until a bit later that I then took over my body from the spirit who was in control prior, and spoke to him via instant messaging. The rest is history. There is not a particular day that I celebrate this, but a period of time where I am more acutely aware of where I am coming from, and how far I have progressed, and feel more in touch with what I consider my origin story this lifetime around. This is Zagreus’ birthday time. So I like to celebrate that and show my gratitude towards him. We also exchange small gifts, and make a larger meal. We also celebrate the coming of Winter, which is his season (and I am quite fond of it as well). Like most Westerners, I celebrate the New Year on January 1st. But it is just one of several “new years” I feel during the year. It tends to be a time of reflection, and setting hopes and goals for the coming year. This is the day that I took over this body from Kizzy, who was living this life prior to her leaving it to me. So I consider this my “real” birthday. I tend to spend it grateful for just being alive, and marking another year here. This is the anniversary of my espousal to Z. We basically do whatever we feel like doing on that day, but like most holidays for me, it is a lot about just emotional and mental observance. Late March/early April, I had my first shamanic death and rebirth experience, which more firmly cemented me as belonging to Z. So this is yet another time I spend thankful for him, and seeing how far I have come. We do what you would normally expect to do on birthdays. Again, doing what is typical for birthdays. And trying not to have an emo outburst at getting older. I associate this time period with Dionysus. It was around this time he first showed up, and like the Winter Solstice is Zagreus’ domain, this is his. But even more than that, it seems to be one of the biggest turning points of the year for me, and sets the tone for the next several months. One year, it was when all the awakening as Britomartis began. The next year, it was about owning up to being a prophet, and oathing myself to speak as a voice for Zagreus (which is partially why this blog is around). This year, it was about letting go of hating myself, which has been the hardest of them yet. You hopefully get the idea. So, there are some brief summaries of the holidays that first pop into mind. I am not very good at formal observance, but tend to just go with whatever feels right at the time. (Then look it up later and facepalm to learn it is an established holiday/festival, as often happens). 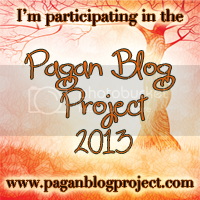 This entry was posted in Uncategorized and tagged 30 Days of Paganism, Holidays. Bookmark the permalink.